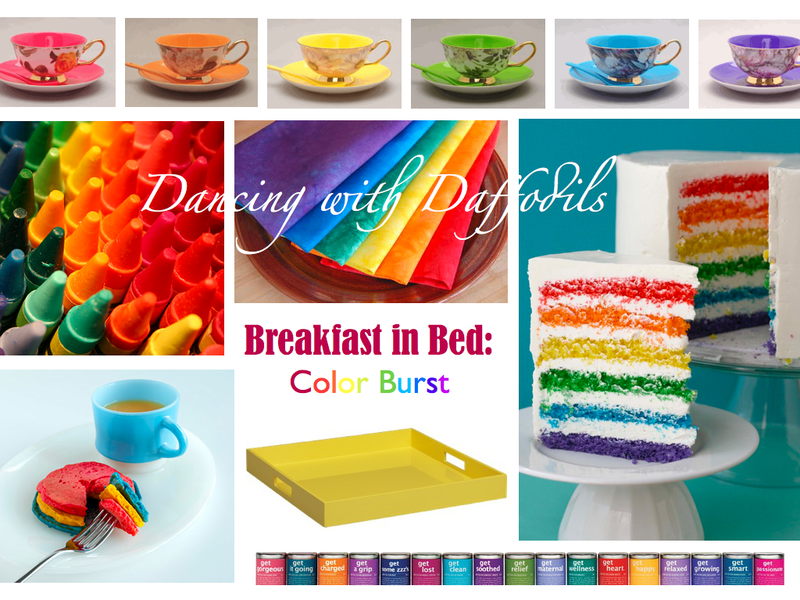 Breakfast in Bed this year should be a BURST of COLOR! Color makes me delirious with happiness. I love the British spelling of colour (a little random, I know). I delight in reading paint-chip colors. I dream in color – brilliant blueberries, vibrant violets to rosy red roses. I stare in child-like wonder at brand new boxes of crayola crayons imagining all the possibilities…. a rainbow of cloth napkins from Jupiter’s Child…. How about a plateful of technicolor pancakes inspired by Every Food Fits? Or duplicate this edible masterpiece from Whisk Kid…. Breakfast in Bed wouldn’t be complete without a brightly colored serving tray from Crate and Barrel. 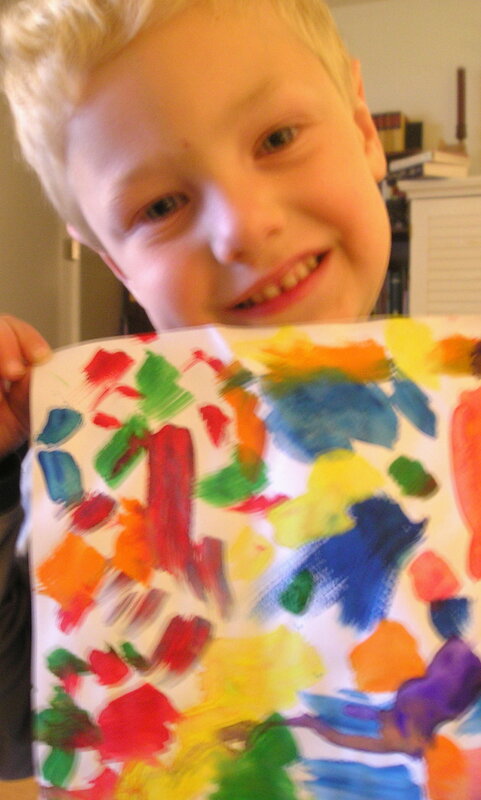 But the piece de resistance would be brilliantly painted artwork made with LOVE for Mommy! Happy Mother’s Day to my gorgeous and colorful Mom. As I age, I hope to be as generous and confident and creative as you (and pretty, too). You live with your arms open wider than anyone I know. To my spectacular sisters, each a dramatic and independent color, you remind me of our mother with your humongous hearts and bold beauty – you inspire me like no one else. To my mother-in-law, a veritable rainbow, you have loved me as your own – I’m truly blessed. And, to my jazzy friends, who are incredible mums and exceptional women, you encourage me and teach me and challenge me. Wishing you all a full-spectrum of blessings and joy on Mother’s Day and beyond!! What a wonderfully colourful post! It’s quite amazing how much colour can influence our life – and affect our moods. Jane, your words about your mum and your sisters was so very lovely … “You live with your arms open wider than anyone I know” that is just so beautiful! What would we do without our mums and our sisters! PS I wish I hadn’t seen your cupcake post above … I may just have to head out to the supermarket now! Thank you, Allison, for your kind words. Mother’s Day may have become a commercial holiday, but it’s still a yearly reminder of how utterly blessed we are! From your most correct spelling of colour, I’d assume your not from these parts or I’d save a cupcake. Actually, the flavor of the day is Guinness in honor of my son’s 15th birthday (he had Guinness cake in Ireland last summer & I’ve been determined to try my hand at making it)…. Tasty! !